Video length options: 3~ 90 seconds. 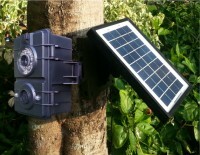 High illumination Infra-Red flash to take monochrome clear picture and video at night within 50 feet. Waterproof matched with IPX5 grade . Suspend function to save power while memory full. Pause setting options: 0,1,3,5,10,20,30,60 minutes. Quick Shot mode allowed for more taking up to 3 pictures before a next period of pause. Back up function avoid a risk of camera non-working during a long cloudy period. Web site last updated: April 21. 2016. Renewed informations for all Models. Copyright © 2015. Compu-Technic Digital Developement Ltd. All rights reserved.